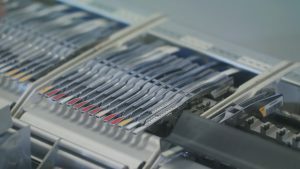 The purchase of material for a PCB assembly can be far more complicated and far more important to a quick and smooth assembly process than most people think. SlingShot’s procurement team has deep experience in acquiring components and bare board material, working with a broad, vetted AVL (Approved Vendor List). The team focuses on matching customer specifications to the right component and board vendor to maximize fit to requirements while minimizing cost. Our AVL for components includes more than 20 U.S. distributors that carry well over one million different components. Our primary partners for components include Digi-Key, Mouser and Arrow. We have a smaller group of hand-picked board fabrication partners that cover the spectrum of board requirements from simple 2-layer boards to highly complex HDI boards. The bulk of our board fabrication is completed in the United States. With customer approval, we can also source boards overseas from selected partners. Our procurement services cater to both quick turn assembly projects where speed is a leading priority as well as scheduled production builds where competitive pricing, bulk purchases and lead-time management become of foremost importance. Given the expertise of SlingShot’s procurement team, there are many crucial factors to understand fully the vast benefits of turn-key services over customer provided material in a consigned kit. Check out the Myths of Consigned Kits here. SlingShot Assembly processes are designed to flow fastest and most efficiently with turn-key material. We have integrated data exchange with key suppliers for both quoting and purchasing to streamline several processes including Quoting, Procurement, Receiving and Kitting. We certainly understand that customers often have specific components in stock due to lead time and other factors and will accept consigned material. It is important to understand that consigned material typically will lead to delays in projects. We strongly encourage customers to take advantage of our turn-key services.